Abstract submissions for Oral Presentations has now Closed. Across North America, hailstorms are responsible for over $10 billion dollars in annual property damage. 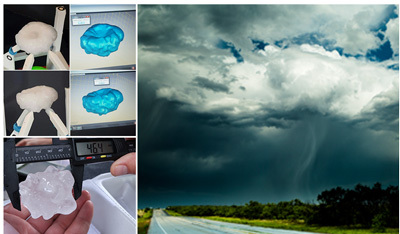 The increase in the impact of hailstorms has outpaced advances in detection, forecasting, and mitigation. The National Science Foundation, the National Center for Atmospheric Research and the Insurance Institute for Business & Home Safety are organizing the first North American Workshop on Hail and Hailstorms. The workshop will bring together public and private stakeholders to discuss the current state of the science regarding all facets of this peril and provide a look to the future. The workshop will be held at the NCAR Center Green 1 (CG1) campus, 3080 Center Green Drive, Boulder, Colorado. To download the workshop presentations, please click on this link. The workshop will contain a blend of invited speakers, expert panel discussions, traditional symposia and poster sessions related to the topics listed above over the course of three full days. Abstracts submissions are no longer being accepted for 2018. To view the PDF files of presentations, please click here. The workshop registration fee is $150, due before July 1, 2018. Late registration is $250. Registration can be made at 2018 North American Workshop Registration and space is limited. National Weather Association Seal Holders can receive Continuing Education Credit, one CEU credit per full day of attendance. AMS continuing education credit for Certified Consulting Meteorologists (CCM), Certified Broadcast Meteorologists (CBM), and Sealholders equals one professional development point per day of attendance. Sponsorship and exhibitor opportunities are available. For interested sponsors, and more information please contact the steering committee at hailworkshop2018@gmail.com. Robert Wright – Robert L. Wright and Associates Inc.
Bryan Wood – Assurant Inc.
Top photo courtesy of Dr. Howie Bluestein. Other photos courtesy of Insurance Institute for Business & Home Safety and Wikimedia.